Figuring out just where to start Terry Pratchett's sprawling, character-dense Discworld series can be a little daunting. Fortunately this chart, lets you figure out just how to follow your favorite storylines and characters as they move from book to book. 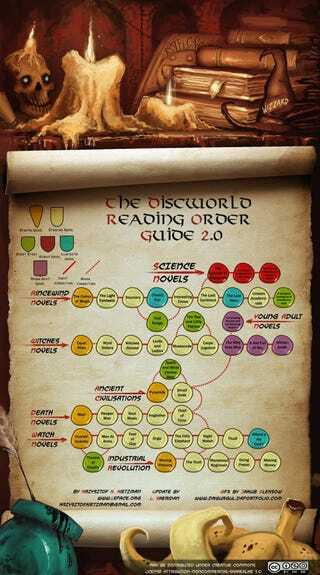 In response to a thread about the books we're reading both now and next, commenter Jarm, who just started on Discworld, pointed us towards this chart from Krzysztof Kietzman. In addition to mapping the direct connections between storylines, it also shows some of the looser crossovers that link up the books. Have an alternate theory of how the books should be ordered? Chart it out for us in the comments.